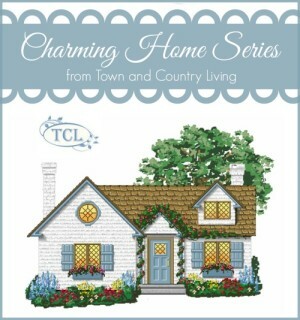 Today’s charming home tour features a beauty on the beach! I fell head over heels in love with this east beach house when I saw it. 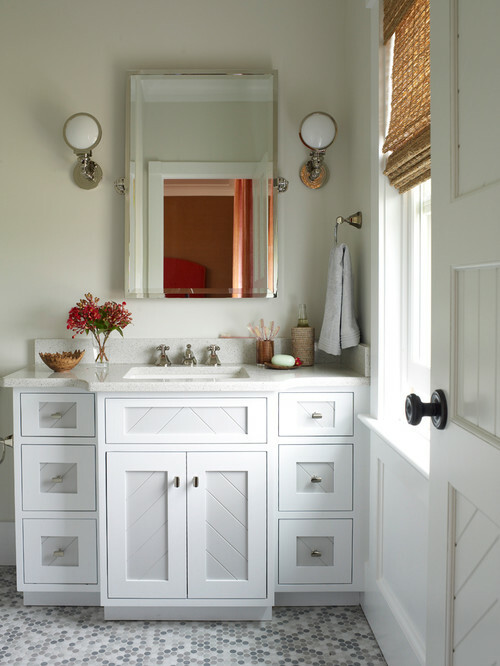 Decorated by interior designer Phoebe Howard, known as a foremost authority on Southern style, it oozes simple charm from every room. I think you’ll love all the details and comfortable styling! 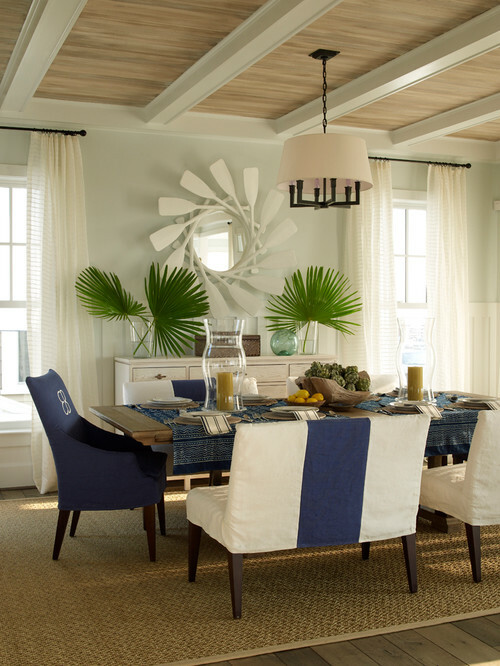 I first came across the east beach house last week when I featured my post on Decorating with Navy. This photo of the living room is one that I shared. The dining room is equally charming. Note the ceiling treatment and the fun mirror framed in oars. Soft white curtains keep the windows light and airy. I recently added white curtains to most of my own windows – I’ll share them in a few weeks when I publish my summer home tour. The kitchen in the east beach house is both functional and beautiful. Cabinets the color of sand and soft blue subway tiles mimic the beach views seen from the windows. A colorful breakfast nook is a cheery place to start the day. Flip-flop artwork lends an air of whimsy. 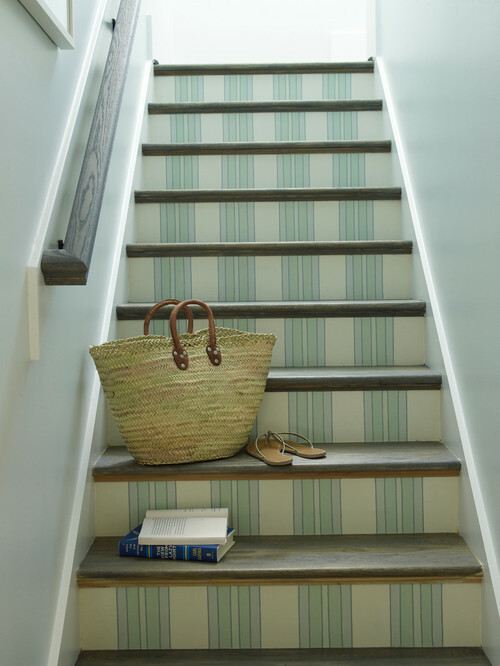 Even the staircase takes on a playful vibe with its striped step risers. All of the bedrooms are beautiful! 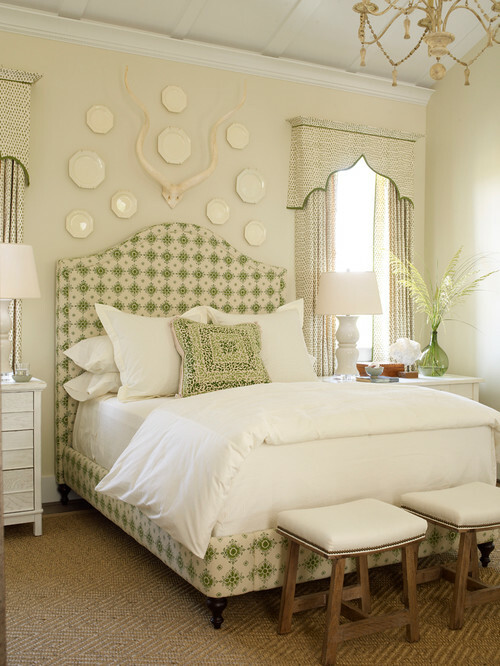 A vaulted ceiling crowns an upholstered bed in green and white. The bedroom comes complete with a comfy sitting area. Note the glass lamp filled with seashells on the end table. 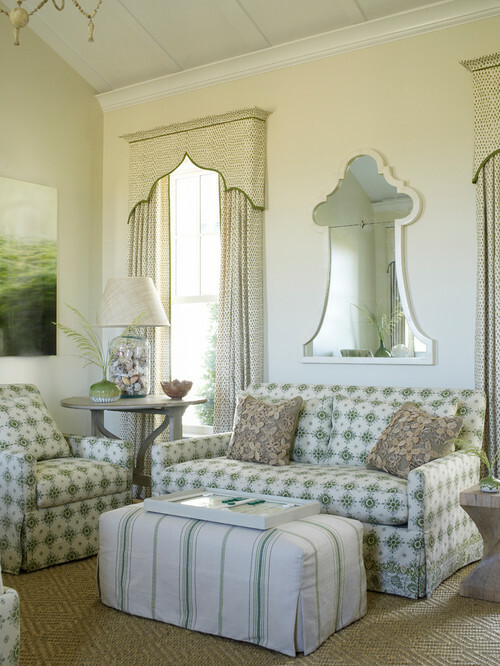 The mirror mimics the shape of the valances over the window. Another bedroom sports framed maps and a porthole mirror. A simple headboard supports pretty plump pillows in soft tones of the sea. The jute rug underfoot calls to mind the sandy beaches just steps away outside. The bathroom features a penny tile floor in soft grays. A bamboo shade adds texture to the white room. In another bathroom, a luxurious garden tub beckons you to unwind and de-stress. You’ll enjoy gazing out at the beach and ocean in this cozy nook with a telescope for watching boats. There are more photos of the East Beach house that you might want to see. Every nook and cranny is just beautiful! When can I move in? ha! This is just gorgeous. We have had enough rain here in Central Indiana to make us feel like we live by the water. Love the addition of greens to the home…the bedrooms are lovely. Love the use of color in this home. Lots of attention to details. Really lovely and relaxing home. It is a lovely place, i could set at those windows and watch the ocean all day,maybe take a nap. It would be great for sleeping, listening to the water at night would put me to sleep. I’m a water logged central Indiana resident also and am ready for some dry weather. 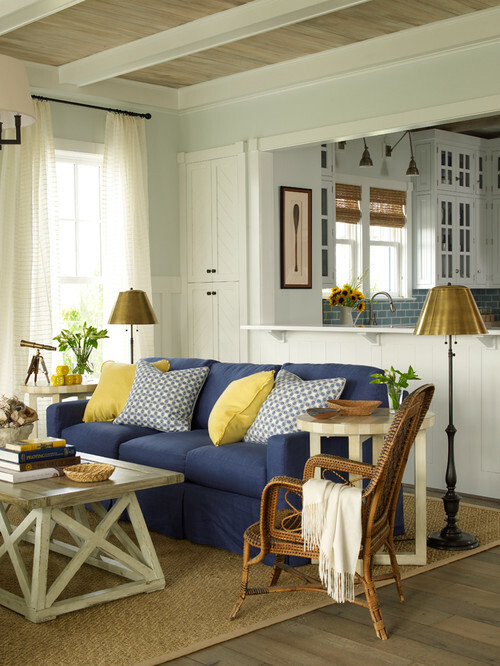 This beach house is right up my alley – not huge and mansion-like, but cozy and warm. 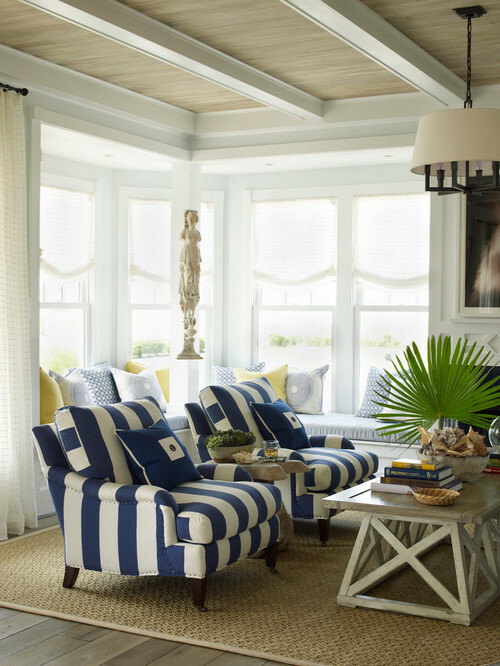 I love the navy and navy and white fabrics and should I ever be lucky enough (lottery) to have a beach home, it would definitely be decorated in blue and sand colors. Sigh …..